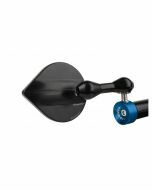 All Driven bar ends, lever guards and mirrors come with adapters to fit into a hollow-ended handlebar from 16-19mm ID. Bike specific adapters for original equipment are available separately, if unsure about your specific application please inquire before ordering. The Halo bar end mirror is machined out of billet 6061 T6 aluminum using 3D machining to create an extremely durable and lightweight mirror with a hi-tech look. Driven uses a special blue tinted anti-glare mirror for superior visibility. 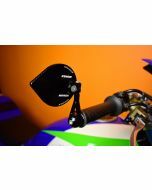 Positioned in an attractive CNC machined housing with a stainless steel ball and cup system which allows the mirror to adjust infinitely for the best viewing angle and rider ergonomics. The mirror can also be flipped while negotiating heavy traffic. 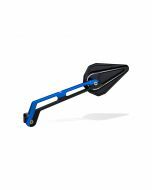 Driven's new wedge mounting system allows the bar end mirror to fit most bikes with hollow bars or aftermarket handlebars.